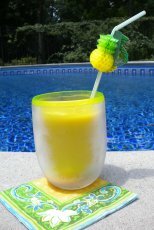 Baby pool toys can be store bought, like rubber duckies or simple containers, like measuring cups that one would find in a kitchen. Our children grew up in Miami and we spent lots of time at the swimming pool. They were actually swimming before they could walk. 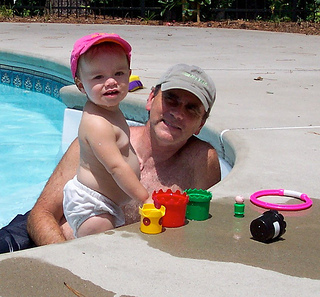 Now our grandchildren spend many of their summer days at our pool. Our children and grandchildren have all loved being in the water. 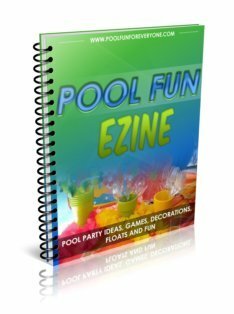 There are many simple and inexpensive infant pool toys and floats to keep them happy and occupied. 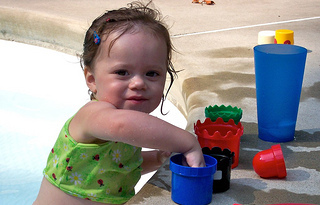 Infant pool toys can be as simple as a set of squirting bath toys or colorful, little stacking cups for playing on the steps to the swimming pool. The favorite place for little ones to play is the pool steps. When we put in our pool, we made sure we had long and wide steps for children and adults to sit on. Kids love to pour water from one container to another. Baby pool toys need to be colorful and "floatable" if that's a word. The favorite place to play for those who are old enough to sit up or stand is on the pool steps. Our kids and grandkids loved simply playing with colorful, plastic measuring cups and spoons. So you may have some "instant" baby pool toys sitting in your kitchen. Something as simple as colorful rubber duckies or these frog squirter toys keep your baby pre-occupied while in the pool. Babies like having something to hold on to. Use fun, colorful bath toys as baby pool toys. 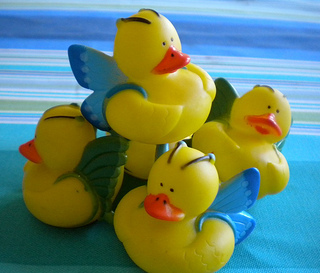 Use bath squirt toys such as these Sea Bath Squirties to play with in the pool. Find squirt toys that match the interest of your child - whether it's boats, cars, or animals. These plastic toys come in a wide variety of styles and designs. Be ready to catch or swim when you hand over splash balls to your little one. You can find these pool toys at your local dollar store, pool store or Target. The frog shaped ones were easy for our 1 1/2 year old to grab and throw (rather than the ball shaped ones). What child doesn't enjoy rubber duckies? Let your child play with them in their pool float or on the steps. Often toys that are enjoyed in the bathtub can be enjoyed in the swimming pool. Babies love to be holding some kind of toy in their hand (or putting it in their mouth) and rubber duckies fit "the bill" :). 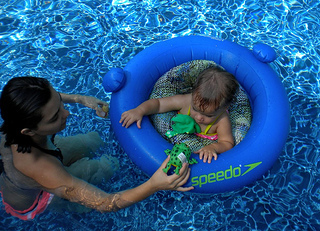 An infant pool float is a must for anyone who wants to spend time at the pool with their baby. We have always had a baby pool float for our kids and now have owned several different ones for our grandchildren. This one pictured had a squeaky toy in the front of it that keeps babies entertained. Babies love being able to kick their feet and splash the water with their hands. Of course never, leave a child unattended. 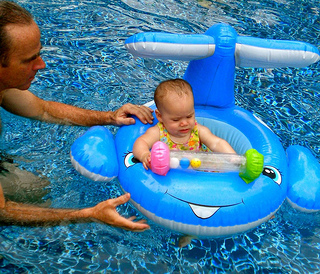 You must always be standing right next to the infant pool float as the infant can tip out into the water. This float is large and very sturdy. The shade canopy is easily attached and removed. 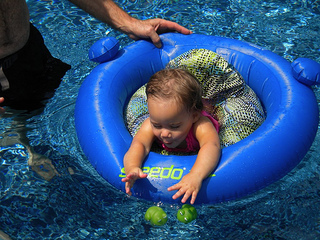 Baby pool floats keep babies happy in the pool, without having to hold them. Our granddaughters spent many happy hours in our pool kicking their feet and enjoying the water sitting in an infant pool float.